I have had my eye on a tulip skirt for a while and I’ve spent a lot of time drafting this skirt. FREE PATTERN HERE. The pretty tulip shape come from a combination of a curved shape cut on the bias and 2 sets of pleats that sit on the hip. The two front layers curve gently across each other and open as you walk for easy movement. The inspiration was this beautiful blue pleated skirt (below) by See by Chloe that nips right in at the waist before curving out. I also quite liked his subtle grey Calvin Klein tulip skirt (that you can find in House of Fraser at the moment) and is a more affordable version in a beautiful fabric, but it just doesn’t quite cut it shapewise for me. This tulip skirt is the first garment I’ve designed for ages that actually requires a ZIP. I steered clear of zips for YEARS, and can understand anyone’s antipathy towards them. However, the solution is far simpler than I could ever have imagined – a zipper foot. 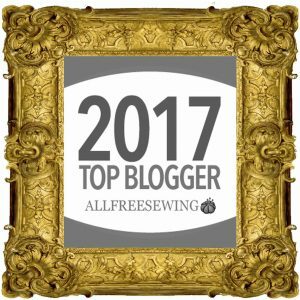 Should you feel the same way, here is an article from So Sew Easy explaining the different types of zipper foot you can get. I’ve just got the basic one that came with my machine. 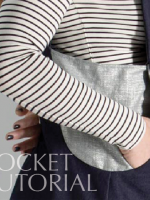 It’s a very simple little device that holds your zip in place as you sew around it. 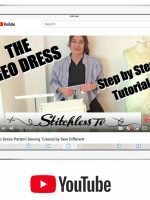 And here is a Youtube tutorial from Sewing Parts Online on how to install and use a zipper foot. I used a 6″ (15cm) zip for this skirt. This gorgeous red linen that I have used to make the skirt comes from Fabworks Mill Shop – cost £5 / metre. (There’s a lovely deep purple as well that would look amazing made up into something.) Apparently this linen was colour printed on both sides (rather than dyed) which gives the fabulous strong criss-cross texture. When you cut into the fabric you can see that the centre of the fibres are actually still white. It’s a natural fibre so breathes really well and is perfect for the hot weather. Of course, linen does, by nature, crumple so it’s always a challenge to keep it looking good. As far as putting it together, the pattern doesn’t come with any instructions I’m afraid, although all the pleats and darts are marked on the pattern. The waistband fits inside as a facing. I used a heavier weight fabric for this inner facing to help the skirt hold its shape. 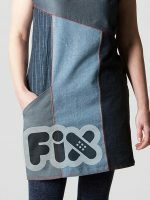 The raw edges of the bottom and front spilt are finished with self-made bias binding. The picture on the right shows how neat this technique can look. 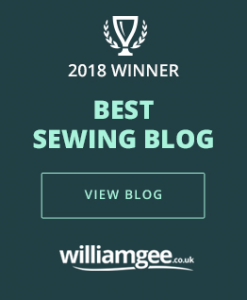 Have a look at my page on making bias binding if you’re not sure how to do it. If you’ve never done it, it’s very easy and something you will use over and over again. In fact I think nearly every one of my patterns says finish with bias binding somewhere on it. The Spring Tulip Skirt is just available as a FREE download in a UK size 12. 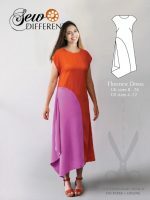 For those of you who are confident, there are some tips on the Making a pattern fit page about how to rescale a pattern, but this skirt is quite a difficult one to attempt due to the curved shape. I wouldn’t cut your best fabric until you have made a toile and checked that it fits you first. 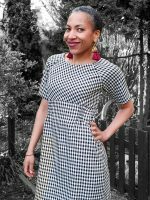 ← Previous Post: Peasant Top – FREE SEWING PATTERN.